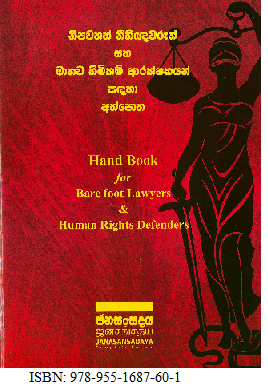 The Hand Book for Bare footLawyers and Human Rights Defenders is a very useful and valuable contribution for litigants in Sri Lanka. The book is produced by Janasansadaya, and edited by Chitral Perera and Chandrasena Badhugama. Janasansadaya is a reputed organisation based in Panadura, Sri Lanka, which has been serving litigants from mainly low incomegroups. The concentration of their work has been to assist victims of human rights violations, particularlyvictims of police torture. Janasansadaya has been carrying out this work for almost 25 years now. This handbook is a product of their long experience, relying mostly on material produced by the organisation itself, while providing assistance to various types of victims who have approached them over these long years. The idea of the ‘barefoot lawyer’ and the protection of human rights are explained in the first Chapter. It states that although Sri Lanka has laws, it does not have the rule of law. When there is no rule of law, even the law itself becomes wild; various people utilise the law to commit illegal acts harmful to the society. When various persons utilise the law for their own purposes, and do the very opposite of what the rule of law is meant to achieve, the situation that arises is one of absurdity. And such a situation exists in the country now. Those who are powerful can get anything done under the name of the law. It is those who do not have such means and those who are in a helpless situation that become the victims of this unfortunate situation. Unfortunately, some people exploit these helpless people and try to take all kinds of advantages from their situation. There is thus a need to genuinely assist those who are in this situation, enabling them to fight against the various injustices they face. This book is an attempt to share information useful to people in that situation, so that not only could they know their rights, but they could also know how to intervene within the system and thereby become active agents of their own rights. Agencies that must be dealt with in protecting rights are the police, the judiciary and the Attorney General’s Department. As a result of the lawlessness that prevails in Sri Lanka, obtaining proper services from these institutions has itself become a difficult affair. In this book, Janasansadaya provides people with various methods by which their interventions with these institutions can be improved. The book first explains in simple terms what the institutions are supposed to do, and then explains what an individual can do if those services are not provided to them, with practical experiences that Janasansadaya has gained in the course of its work. Situations such as arrest while being at home, the right to obtain certificatefor confirming the arrest and what an individual should do when he is arrested in order to safeguard his own rights, are explained. The Hand Book also explains what needs to be done when a person is arrested at his work place or when he is on the road, and various other occasions in which a person may be taken into police custody. Then the Hand Book explains how to obtain copies of complaints made against an arrested person. The sample letters that are provided can guide a person to write letters to the police and other institutions asking for certified copies of statements. The book also explains what needs to be done when one is arrested under a warrant. Various types of situations that have arisen have been given as examples so that a person facing such a situation can utilise this knowledge in protecting his own rights. One section of the book is devoted to people who have been taken into custody for ransom. Various examples of how this has happened in the past are provided, followed by the various steps that can be taken under such circumstances. Then arrest under anti-terrorism laws or emergency regulations is explained. Even under these, there are various methods by which one could intervene immediately if one is wrongly arrested under these draconian laws. The Hand Book also explains how a recording could be done of the arrest. If it is not possible to get the police to make such a recording, then it could be done by way of writing letters to the police station or to higher authorities. The Hand Book then explains the situation of detention and the right of persons who are under detention, and also what could be done to keep a faithful record of all events while under detention. If what has been done to a person is illegal, even when he is under arrest there are methods by which he could get such things recorded and later bring them to the notice of courts or the human rights commission and the like. A large section of the book is devoted to those who have been tortured under arrest. This is an area where Jansansadaya has a lot of experience, and they have utilised this experience in order to advise the victims of what they should do when they face such circumstances. The law relating to torture is explained in detail, with examples of various letters previously written on behalf of persons who have been tortured. These letters which have been written to authorities while the person has been tortured have proved very useful later, when the matters are brought to courts for litigation of one form or another. In fact, the entire book consisting of 88 pages is full of very practical advice for those who are faced with various types of problems relating to arrest, detention, torture and other difficulties in obtaining redress. The value of this book is that it comes from a group of individual citizens who are not professional lawyers, but who have been able to assist many victims, often better than the lawyers themselves. The very idea of barefoot lawyers is that there are things people without professional qualifications can still do in order to safeguard their rights and the rights of others, if they have the courage to do so. This aspect of courage is emphasized because very often, even when people approach professional lawyers for advice, it is often difficult to fight with the police or deal with the neglect of the Attorney General’s Department, or with the various problems arising in courts. Janasansadaya, with its extensive experience, has shared with such persons what can be done by themselves, and with the help of others. The book is a testament to overcoming fears and obstacles, many of which are created by self-interested parties. With a bit of knowledge about the basic rules of law, and above all with the strength of character to resist injustice, Janasansadaya states that people can strengthen themselves and protect their own rights better.